I added the Tapatalk app to my phone... let's see if this works! Two cards I created for the Cards challenge. I'll update my points tonight. nylene I love your Back to School page! Great photo and I love the bright colors. This is a scraplift on Nylene's "Alex-isms" layout, for the 28-4-28 challenge. Paper & Elements: 'Birds Go Tweet' and 'Beautiful Day' by Lindsay Jane, 'Be A Unicorn' by Bella Gypsy, 'LayerWorks No. 990' by Studio DD. Speech Bubbles by The DigiRainbow. Day four take 3/5 challenge. craftymom101- love your happy cards. elaynef- you are on a roll, girl! Between last month & this. I need to enlarge your pics to take in all the details. I like your style! jeremysgirl- You have the nicest smile! You can definitely see the joy in your pictures. 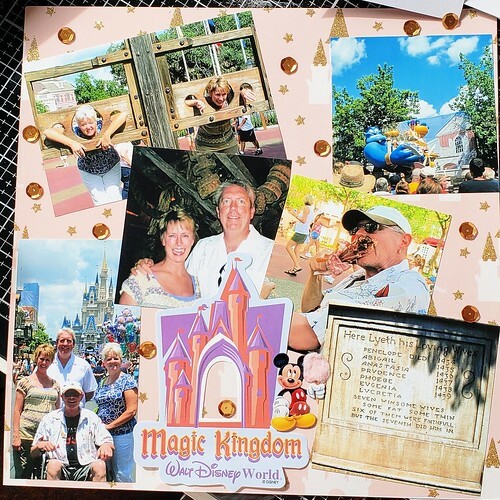 I am still plugging away on my 2010 Disney trip. (We are going to go to Italy with this couple this Fall & thought it would be good if I finished these before then. LOL) I did get our trips in 2016 & 2018 done, though! After spending many hours on the top layout I did two quick ones. elaynef, I understand about the Emerson quote on the b-day card. I have a DSIL who comes up with interesting and vague quotes. Great job on the cards. I love the Asian animals on the front. I’m sure she will appreciate the work you did to get the Chinese characters right. ~I love the scenery photos you took on Queen Anne’s Lace and Artesian well. They look so green and pretty. Great job on the Queen Anne’s cluster. ~ Is that Spanish moss on his head? What a cute little actor. I love the red Love jar and the little banner at the bottom of the companion page.~ Those photos are priceless on Lego Land. Love your designs that let the photos take center stage. Cute banner and twine.~ The Big Apple looks like a great time for the travelers, but even more fun for the kids with grandma and grandpa. justjac, grammadee, AussieMeg, @craftmom101, patin, and crystalb you have comments left in the gallery. Beautiful pages! craftymom101, your cards are so pretty. Your stamping is wonderful. Do you use a stamping platform? jeremysgirl, your Sisters page is wonderful. That’s a great photo of the two of you. I love that heart with the tassel.~What a great photo and explanation of the Pisces man. I love the fish icon that you used. He sounds like a great guy. KelleeM, I love the heart background on your Love layout. The metallic title is a great touch. That photo is priceless. What a cutie. ~I love her little tongue sticking out on Super fun. Sweet photos and cute title. Great little banner at the bottom. ~Meg is One is delightful. I love those tiny heart/rosebuds on your paper. The sentiment card is perfect. I hope I have not skipped anyone. I love seeing all the new layouts popping up. Wow! You gals have been busy! Your cards are lovely, craftymom101. Love the diecut flowers and that font. jeremysgirl, those pages are awesome! I love the pinks and the hearts on your page about your and your sister, and the story on Romancing the Pisces man! Great Disney memories, patin. Love the castle and all the sequins. KelleeM, your little one is darling, and your pages are adorable. My favorite is the one with all the HEARTS!!! So sweet! Florida Aquarium layout. I'll add up my points later tonight! Love the b&w stripes, craftymom101 . Love the fresh colours of the greenery and the title. Also love those tiny hearts and stars. elaynef, you have been a crafting machine! Your cards are really cool. I am sure your family loves both the photos and the humorous little extras. Awesome idea for the Chinese zodiac page! Love how each double page LO is so unique. The Palmetto Park pages I love the tree pp and icons, and the vellum and flowers. On the "Actor" page, I LOVE the caption! And that jar on the map is a great extra. The photos on the Legoland pages really caught my eye. I love the banners on this and your other pages. That Big Apple Tourist page is really cool. Love the large apple under the title and the smaller ones on the pp. Great fall colours on these two pages. craftymom101, your cards are bright and cheerful and wonderful! The aquarium layout is great, love the colours and your placement of clusters/journaling etc. dasmith2, love all the warm browns and nature themes, gorgeous. KelleeM, cuteness overload! Love your fun icons! 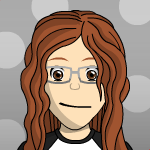 jeremysgirl, you are rocking the challenges! The lemon/heart circle embellie is cute! patin, great memories, looks warm, I like that you can still see and take in the details of the photos! AussieMeg - LOL, those are great memories and I love the emphasized speech bubbles that accentuate the photos so beautifully. On the "be a flamingo" card, I added "or blend in and stay home...yeah, that's more like it"
a full can of fizzy water (only water fortunately) spilled on it just as I finished it and was waiting for sequins to dry!!! I haven't finished reading the thread, but wanted to say I never could figure out how to post from Flickr with my phone. If I'm posting from my phone I use the tapatalk app, it's easy! ETA: I should have finished reading the thread first haha! Glad you got it figured out! Page 2 There is love in the gallery for you nylene, patin, @craftymom1, kitbop, grammadee! @elyanef love the cards and the way you make them so fun! I really like that you used different backgrounds on the Palmetto Park pages! I have some clips that I haven't known quite what to do with, love that, and your clusters, and that map is perfect! Great photos for Legoland, and I love that flag banner at the bottom. The Big Apple Tourist pages are just beautiful! 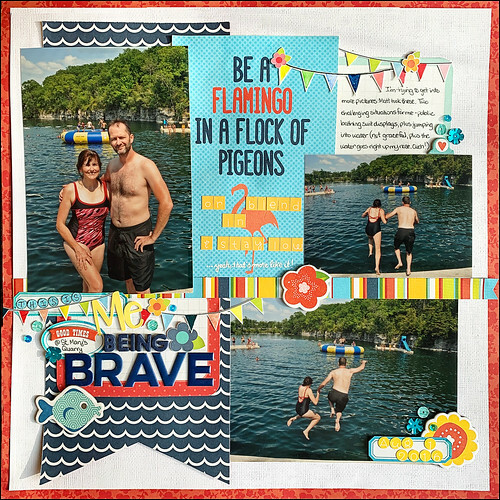 I love the colors and that photo grid! And I also love it that you are going to stop counting points because it doesn't "spark joy" I'm becoming a big believer in that concept! Beautiful work ladies and I say it every time because it's true, so inspiring! Day #9 challenge tone on tone color. I need to come back here and leave some love! Here is a page from this morning. I found an older photo (2016) to go with my birthday page. I wanted to use the Chinese diecuts for the zodiac challenge b/c this is MY year. Have had these for about 7 years. jeremysgirl - I LOVE the title because it is so fancy! Beautiful LO. 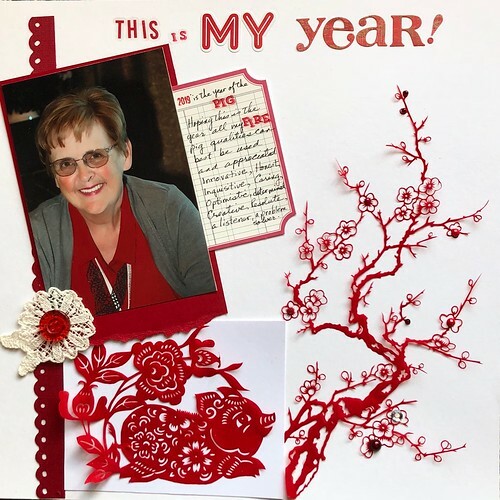 grammadee - wow, wow, the red/white, the cherry blossom branches, the lacy - it's stunning. I also wanted to dig into my project life cards, and I succeeded! dasmith2 , I love how you reflected the deer image from the invitation onto the page and echoed the colours as well. Very elegant and pretty. jeremysgirl, I love all the flowers and bling on these two pages. Perfect for the prom (?) photos. kitbop , there is love for your pages in the Gallery. kitbop I love your day 2 layout. The pics, the papers, the title treatment. I'm going to lift it. KelleeM - You are on FIRE this weekend. 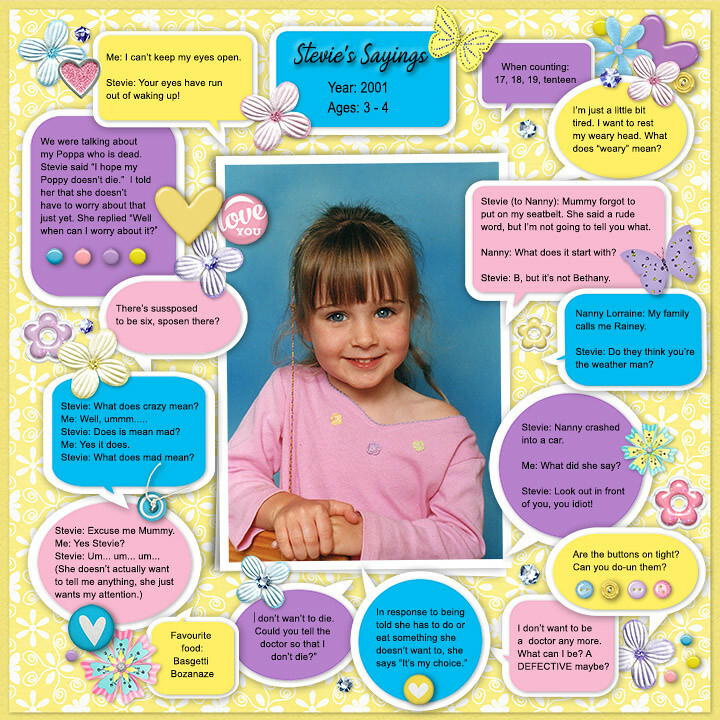 Your little cutie is going to love her scrapbooks. The hearts were probably a lot of work , but well worth it. The superfun sticker is perfect, I enjoyed the park pictures a lot- that is a really fun LO. The funny facee background paper is perfect. @elayenef- The Chinese characters card is soooo clever. craftymom - I really got a tropical vibe from your black & white stripe LO & that worked so well due to your embellies. Great page! dasmith2 - beautiful tone-on-tone work. jeremysgirl - your Fancy title across the page & the varied embellies & paper worked so well together. Purple can sometimes be hard & you nailed it. I LOVE the vintage vibe of your camp picture & the stitching!!! Here is my offering for today. This took me FOREVER. I made 19 of these. Why 19? cuz the die went flipping out of my hand & I can't find it anywhere so there are 19 instead of 20. I have wanted to challenge myself on learning some new techniques. This is called Distress Monoprint & although I didn't achieve the stunning contrast looks that Jennifer McGuire (my Queen Enabler) achieved, I think I know what I am missing for the next set. I have wanted to work on building up my stash of Christmas cards & have decided to do some throughout the year. With the Pea Christmas card exchange, the Pokeys exchange & my friends & family I need a lot & it is perfect for honing my new technique. PS - The card is not warped as it appears in the picture. I am using a few for Christmas thank yous that are way overdue. We are on fire today! Enjoying everyone's layouts! I guess I spilled some very sweet, creamy coffee on my desk some time because I found my stack of Christmas photos totally melted together yesterday....need to stop leaving them near the coffee. page 2 is me and my grandson. I have 12 grands and this is the only one who looks like me...what do you think? He the one with the most make up! Another challenge I've given myself, is to use both sides of the paper. It helps keep the bulk of the books down. Maybe everyone will end up with only 20 books instead of 40. So most of these layouts are both a and b sides except when I just couldn't make it work. Another for the 6x6 pad challenge. (the frames and cards were in that pad, too) Its really a 5x8, and I've got a lot of these papers left, I think I tore out all the papers from the pads and there must be several of them. I think it will work for a lot of things if I'll remember to dig into it. Here's my Day #7 word challenge. I lifted kitbop layout from above. @kellem - really really cute layouts! Love the scene on "fun with friends"
elaynef - your grandson is too cute, and I love the sketchy elements on the wizard of oz page! And I'm always happy to see multi-photo pages - you did a great job of making the photos enjoyable! patin - jennifer mcguire inspires me too! Your card is stunning and 19 is quite an achievement. Card points really do add up quick - I did 6 in january which were very technique heavy, and they racked me up some nice points. WTG!!! I've had a productive day This is my 28-4-28 day 8 lift of Nylene. It was super easy! I dug out an old Studio Calico kit and made good use of it. LOVE this photo of my son on the beach!